Antonello da Messina, properly Antonello di Giovanni di Antonio, but also called Antonello degli Antoni and Anglicized as Anthony of Messina (c. 1430 – February 1479), was an Italian painter from Messina, Sicily, active during the Early Italian Renaissance. His work shows strong influences from Early Netherlandish painting although there is no documentary evidence that he ever travelled beyond Italy. Giorgio Vasari credited him with the introduction of oil painting into Italy. Unusually for a south Italian artist of the Renaissance, his work proved influential on painters in northern Italy, especially in Venice. Antonello was born at Messina around 1429–1431, to Garita (Margherita) and Giovanni de Antonio Mazonus. According to a letter written in 1524 by the Neapolitan humanist Pietro Summonte, in about 1450 he was a pupil of the painter Niccolò Colantonio at Naples, where Netherlandish painting was then fashionable. This account of his training is accepted by most art historians. Antonello returned to Messina from Naples during the 1450s. In around 1455, he painted the so-called Sibiu Crucifixion, inspired by Flemish treatments of the subject, which is now in the Muzeul de Artǎ in Bucharest. A Crucifixion in the Royal Museum of Antwerp dates from the same period. These early works shows a marked Flemish influence, which is now understood to be inspired by his master Colantonio and from paintings by Rogier van der Weyden and Jan van Eyck that belonged to Colantonio's patron, Alfonso V of Aragon. In his biography of the artist, Giorgio Vasari remarked that Antonello saw an oil painting by Jan Van Eyck (the Lomellini Tryptych) belonging to King Alfonso V of Aragon at Naples and consequently introduced oil painting to Italy.. Recent evidence indicates that an Antonello di Sicilia (di Siclia meaning from Sicily) was in contact with Van Eyck's most accomplished follower, Petrus Christus, in Milan in early 1456. 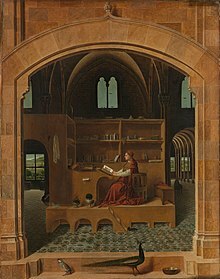 It appears likely that Antonello di Sicilia was in fact Antonello da Messina as this would explain why Messina was one of the first Italians to master Eyckian oil painting, and Christus was the first Netherlandish painter to learn Italian linear perspective. Messina's paintings after that date show an observation of almost microscopic detail and of minute gradations of light on reflecting or light absorbent objects that is very close to the style of the Netherlandish masters, suggesting Messina had personal instruction from Christus. As well, his works' calmer expressions on peoples' faces and calmness in the works' overall composition also appears to be a Netherlandish influence. Between the years of 1456 and 1457, Antonello proved himself to be a master painter in Messina. He also shared his home with Paolo di Ciacio, a student from Calabria. The artist's earliest documented commission, in 1457, was for a banner for the Confraternità di San Michele dei Gerbini in Reggio Calabria, where he set up a workshop for the production of such banners and devotional images. At this date, he was already married, and his son Jacobello had been born. In 1460, his father is mentioned leasing a brigantine to bring back Antonello and his family from Amantea in Calabria. In that year, Antonello painted the so-called Salting Madonna, in which standard iconography and Flemish style are combined with a greater attention in the volumetric proportions of the figures, probably indicating a knowledge of works by Piero della Francesca. Also from around 1460 are two small panels depicting Abraham Served by the Angels and St. Jerome Penitent now in the Museo Nazionale della Magna Grecia in Reggio Calabria. In 1461 Antonello's younger brother Giordano entered his workshop, signing a three-year contract. In that year Antonello painted a Madonna with Child for the Messinese nobleman Giovanni Mirulla, now lost. Historians believe that Antonello painted his first portraits in the late 1460s. They follow a Netherlandish model, the subject being shown bust-length, against a dark background, full face or in three-quarter view, while most previous Italian painters had adopted the medal-style profile pose for individual portraits. John Pope-Hennessy described him as "the first Italian painter for whom the individual portrait was an art form in its own right". Although Antonello is mentioned in many documents between 1460 and 1465, establishing his presence in Messina in those years, a gap in the sources between 1465 and 1471 suggests that he may have spent these years on the mainland. In 1474, he painted the Annunciation, now in Syracuse, and the St. Jerome in His Study also dates from around this time. Antonello went to Venice in 1475 and remained there until the fall of 1476. His works of this period begin to show a greater attention to the human figure, regarding both anatomy and expressivity, indicating the influence of Piero della Francesca and Giovanni Bellini. His most famous pictures from this period include the Condottiero (Louvre), the San Cassiano Altarpiece and the St. Sebastian. The San Cassiano Altarpiece was especially influential on Venetian painters, as it was one of the first of the large compositions in the sacra conversazione format which was perfected by Giovanni Bellini (Antonello's surviving work in Vienna is only a fragment of a much larger original). It is also likely that Antonello passed on both the techniques of using oil paints and the principles of calmness on subjects' faces and in the composition of paintings to Giovanni Bellini and other Venetian painters during that visit. While in Venice he was offered, but did not accept, the opportunity to become the court portrait painter to the Duke of Milan. Antonello had returned to Sicily by September 1476. 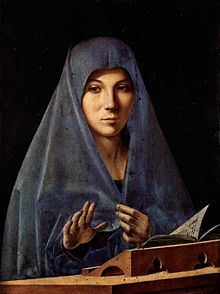 Works from near the end of his life include the famous Virgin Annunciate, now in the Palazzo Abatellis in Palermo, and the San Gregorio Polyptych. He died at Messina in 1479. His testament dates from February of that year, and he is documented as no longer alive two months later. Some of his last works remained unfinished, but were completed by his son Jacobello. Antonello's style is remarkable for its union of Italian simplicity with Flemish concern for detail. He exercised an enormous influence on Italian painting, not only by the introduction of the Flemish invention, but also by the transmission of Flemish tendencies. However, no school of painting formed after his death, with the exception of the Sicilian Marco Costanzo. What's the good word on Antonello da Messina?